The advent of the internet was orchestrated from a struggle of power in the Second World War (World War II) where the US soldiers saw the need of a network. However, its growth together with its benefits has been rapid ever since it first begun and has taken the Nigerians by surprise. Now, the use of the internet for both private and commercial purposes has become pervasive but consequently addictive. Blogging was one of the myriads of benefits that came on the account of the deployment of the internet in Nigeria. 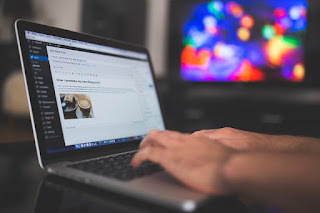 BLOGGING: A blog is simply a website where a person writes regularly about recent events or topics that interest them, usually with photos and links to other websites that they find interesting. A BLOG: contain a list of posts that interest you. BLOGGING is the act of writing blog posts. BLOGGER: is a person who blogs. Over the years, blogging has begun to display an interesting nature which has given birth to very lucrative or illustrious business opportunities. Among these opportunities include SEO consultant, advertisement, promotion of products and services etc. An evidence of the opportunities and benefits that a blog renders can be seen in the colossal number of people or the huge number of people, organizations, and companies who are now setting up a blog for a different use. CREATE A BLOG: The first step that every blogger must undergo is to own a blog which is mostly done by creating one. One could also buy a blog but it would be preferable to create one. There are several ways one could create a blog within a few seconds or it could take you days to create one. I will not delve in too deep but I recommend that you read my post on “HOW TO CREATE A BLOG WITHIN 5 MINUTES”. This tactical guide you need to start up your own mini blog and start making money. START WRITING CONTENT: A blog without content is not worthy to be a blog. Content is the life wire of every blog. The content of your blog should consist of write up which you find interesting and you would clearly love to share with others. Although writing content for your blog may seem easy it is, however, a time-consuming activity when you have a goal for your blog such as trying to rank well on search engine. GET AUDIENCE AND BUILD A COMMUNITY: It is not just enough to create very good content. You would need to get off your blog and start finding readers who are willing to read what you have written or else your content and effort would be wasted and you don’t want that to happen. Inviting the audience to your blog and building a community is not that easy. In fact, this has been the very struggle of all bloggers. However, there are certain techniques you could deploy in boosting the traffic (the number of people that visits your blog) of your blog. · The use of social media platform to boost your traffic; you can post your blog web pages on social channels like facebook, twitter, Instagram and so on. · Applying SEO techniques: This is usually the most powerful way of driving a lot of traffic to your site. You can learn more on SEO from MOZ.COM which has several articles on it. Although, they are several benefits that entice a lot of bloggers to blog, the primary aim/objective is to make money. Once you have created your blog, build its content and get a substantial amount of traffic, it is now time to start reaping the fruits of your efforts in terms of financial or monetary gains. If you have decided to start to make money from your blog; this simply means you have a business to run. In other words, you would need to possess the quality needed to grow a business. You would need patience, assiduity, tenacity, luck etc. A lot of rookie participant or newbie in the blogging world usually believe in just one stream of income; they believe that every other blogger makes money from their blog by just signing up with google ad sense and placing ads banners on their blog. The first most common ways you can make money from your blog is through monetization. Monetization simply entails placing ads banners on the web pages of your web. By doing so, you are indirectly advertising a company’s or an organization’s product or service. However, this is not direct because there is usually no contact between you and the company, organization or person you are advertising for. Rather, they are advertising programs that acts as an intermediary between your mini blog and the company, organization or person you are advertising for. Normally those companies or organization pays owners of the advertising programs while they pay you in return of your service. One of the biggest and famous advertising programs is GOOGLE ADSENSE owned by GOOGLE itself. It connects millions of companies, organization or person who wish to grow a business to millions of blogs around the world. You can sign up with GOOGLE ad sense and wait for their approval if you wish to monetize your blog. Another way of making money from your blog is by selling adverts space to companies, organization or even individuals that will find them valuable. Usually, this is not possible unless you have a substantial amount of traffic or audience that visits your blog. Once you have enough audience, you could sign a deal with any big companies or organization that sells a product or offers a service, therefore advertising what they do on your blog. This is one of the media that Linda Ikeji (richest blogger in Africa) deploys in generating much income from her blog. There are myriads of companies/ organization who are interested in affiliate’s marketers. Among these companies is Amazon.com which is presently the biggest online retailers in the world. Deploying “Affiliate marketing” as a strategy to make money from your blog involves your blog linking to the original company’s, organizations or individual website. Your blog would have a link from the organization etc. that will allow customers to order for the products or service. How this does generate income? Once a customer or client orders for a product or service through the link provided to you by the company etc. you will be awarded a commission. You can make money from selling your products to your audience. Some bloggers sell e-books, while other bloggers use their blog to improve the numbers of customers that patronize their local business. With this, you can make revenue from your blog. With your blog, you could start your own online training on anything you can offer. You can start training people on interest like singing, programming, web design, cooking, game development, engineering and so on. Your blog happens to be a medium where people can come together and share ideas. By doing so, you will not only attract monetary benefits but will also solve a lot of people problem. The acronym “SEO” means Search Engine Optimization, which simply involves growing the audience of a blog of focus through organic search. To gain visibility and relevance in the search engine world is normally a difficult task as a result of competition and the pre-requisite required by owners of search engines needed to make a website or a blog rank in the search engine. This, therefore, makes SEO an opportunity to make money. For your blog to rank on the first page on a search engine like google, it means you have acquired certain SEO techniques which therefore make you a valuable asset to many companies/organization. Many companies and organization are now seeking SEO consultants to improve their blog SEO in order to increase their audience. They are many other ways to make money from your blog. But all the strategies involve hardworking, assiduity, perseverance etc. to make a lot of money from your blog. Nowadays, top bloggers no more rely on one stream of income, they have paved the way for multiple streams of income through an application of more than one strategy of making money from your blog. Good luck, as you take your first bold step. No Response yet for "What is blogging and how to make money blogging"